PARIS --- France and Germany on Jan. 31 awarded a two-year, 65-million euro contract to Airbus Defence and Space and Dassault Aviation to define the general architecture, and the industrial organization, of their next-generation combat aircraft, according to senior French officials. The contract kicks off work on the new combat system, known in France as the Système de Combat Aérien Futur (SCAF) and in English as the Future Combat Air System (FCAS), and was awarded by France’s defense procurement agency, DGA, acting on behalf of both governments, to Airbus and Dassault as co-contractors. Its 65-million euro cost is split between both countries on a 50-50 basis. 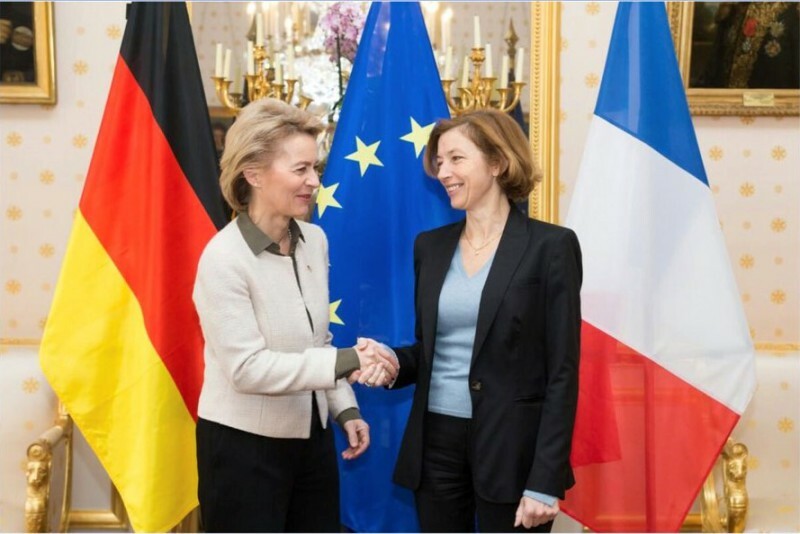 The award will be officially announced on Wednesday Feb. 6 in Gennevilliers, near Paris, when French Armed Forces Minister Florence Parly and her German counterpart, Ursula von der Leyen, will together visit a Safran plant and witness the signing of a Letter of Intent between Safran and MTU Aero Engines on the SCAF program. The ministers will also visit the PFX research center where Safran is developing high-technology blades for advanced turbines. A spokesperson for the German Ministry of Defense said in a Feb. 6 e-mail that "we cannot comment on a contract concluded between DGA and Dassault / Airbus D&S, but following parliamentary approval, Germany intends to participate in this study contract and wants to carry out a joint conceptual study on the Next Generation Weapon System (NGWS) in the Future Combat Air System (FCAS) within this framework together with France." "Dassault and Airbus D&S will be equal industrial prime partners within the NGWS / FCAS project. In this role, they will coordinate the respective key areas within the complex and long-term NGWS / FCAS project. Germany and France will continue to negotiate on these key areas with the relevant industries so as to form a balanced and effective partnership," the spokesperson added. Dassault Aviation referred work-share enquiries to the armed forces ministry, while a spokesman for Airbus Defence and Space said that “at the Ministers' meeting at the end of November, both countries communicated that Airbus and Dassault are ‘nominated primes,’" and denied any work-share changes. In fact, their co-contractor status is limited to the architecture study, and does not modify the leadership roles: France will lead the New-Generation Fighter project as well as the Next-Generation Weapon System of which it is a component, with Dassault as industrial leader, and Airbus as junior partner. Airbus will be responsible for the Future Combat Air System, which will integrate the NGWS with other interconnected aviation and space assets. In exchange, Germany will lead the European MALE drone project and the Maritime Patrol Systems 2030 (both with Airbus as industry lead) and the bilateral Future Ground Combat System, with Rheinmetall or KNDS as industry lead, which will ultimately replace both Germany’s Leopard 2 and France’s Leclerc main battle tanks. The Jan. 31 architecture contract officially kicks off the bilateral project, which was first agreed to by French President Emmanuel Macron and German Chancellor Angela Merkel in July 2017, and subsequently firmed up by an MoU between their two defense ministers, and another one between Airbus and Dassault, both signed at the Berlin Air Show in April 2018. In November, the two ministers met againin Paris to lay the ground-work for the Jan. 31 contract. The next step, scheduled for the Paris Air Show in June, will be the award of contracts to Dassault and Safran to design and build technology demonstrators for the NGT and its engine. Since the program was confirmed in April, the general architecture has not changed very much: Dassault, with Airbus D&S as its junior partner, will lead the Next Generation Weapon System program and its main component, the New-Generation Fighter (NGF) which it will also develop, together with its immediate support environment comprising unmanned wingmen, legacy fighters like Rafale-X and Eurofighter, tankers and AEW&C aircraft. France will also lead the development of the New Generation Fighter’s engines, which will be led by Safran Military Engines with Germany’s MTU Aero Engines as a junior partner. Airbus DS, on the other hand, will take the lead for the network of sensors and systems into which NGWS will be integrated – the Future Combat Air System - and which is envisioned as integrated network of space-based assets, manned and unmanned aircraft, missiles and other ISR and EW assets manage the aerospace war. Much remains to be decided, however, in terms of which assets will be combined into SCAF/FCAS; the definition of their missions and thus their technical requirements as well as who will design and produce them. These systems range from missiles to satellites to ground-based radars to other sensors, the elaboration of tactical and strategic orders of battle, and fusing them into a common operational picture. This aspect of the development work will also be led by Airbus. -- This story was originally posted on Feb. 04 at 17:00 CET. -- Feb 06, 2019 at 17:30 CET: Added comments from a German defense ministry spokesperson in the 4th paragraph.